Provide your clients and staff with a professional, high quality note pad holder to use during meetings. 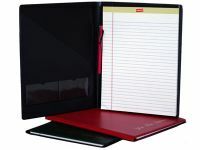 Legal Binders Now's note pad holders are constructed of long-lasting leather print, so you can be sure that it will continue to look professional, even if it is used daily. Custom imprinting is available to add your firm's name to the cover.